Monday January 24 1910 I baked cookies in the forenoon and got the dinner so I ate and was gone at 12.12 for down town. Called at Carrie Anderson's Mildred Stevens and Mrs Smith's where I left a book for her to read. I then went to Ida Anderson's for a record out of the old bible that Lydia wanted. I stopped at the doctors office and got home at 5.30. Tuesday January 25 1910 Will closed the deal today for the Hoffman place paid $100 down I got at my work early. Mother and Hattie came up in the sleigh. We had such a nice days visit and the weather was the best we have had in days. I read all evening in "the Calling of Dan Mathews." 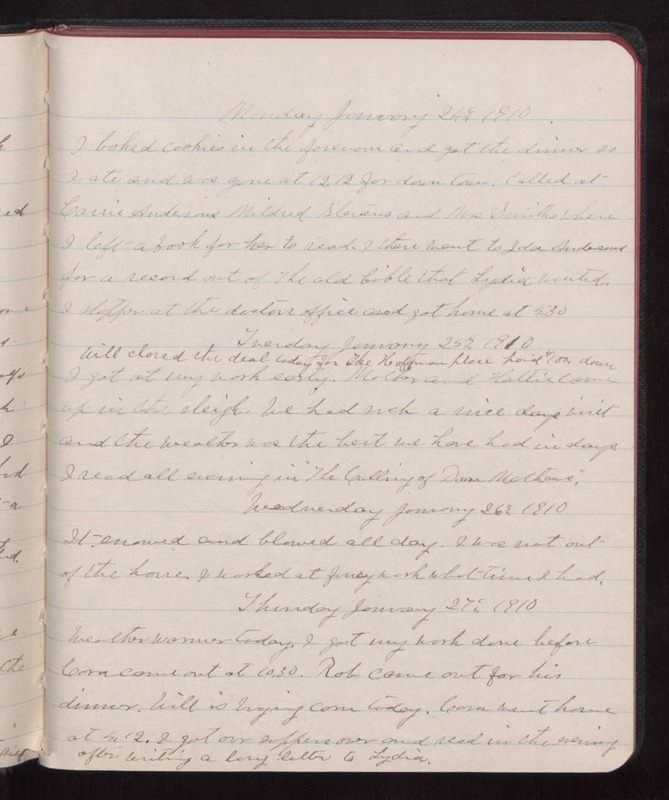 Wednesday January 26 1910 It snowed and blowed all day. I was not out of the house. I worked at fancy work what time I had. Thursday January 27 1910 Weather warmer today. I got my work done before Cora came out at 10.30. Rob came out for his dinner. Will is buying corn today. Cora went home at 4.12. I got our suppers over and read in the evening after writing a long letter to Lydia.